This recipe for 30-day dry-age Stanbroke Porterhouse steak really lets the steak be the star. Smoking or grilling the steak helps to release the flavours from the dry-ageing process. 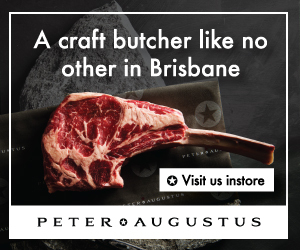 You can dry-age the beef yourself, or pick some up from any good butcher. Over a medium heat sauté the mushrooms, garlic and shallots until the mix is a deep brown colour. Add the white wine and reduce until almost evaporated, then add the chicken stock and dry shiitake mushrooms. Reduce by half again and add the cream and herbs, turn the heat down to low and let simmer for 20 minutes or until thickened. Season and remove the dried shitake. 1 hour before cooking, remove the steak from the fridge and allow to come up to room temperature. If you are using a wood grill, have your coals banked up under the grill before you start. You need to have the grill very hot before the steak goes on to develop a nice crust on the surface of the steak. Alternatively, a good quality cast iron pan works very well. Season liberally with the sea salt and a little oil. The sea salt will first season the steak but will also help prevent the steak sticking to the grill. At this stage I don’t like to season the steak with pepper as I find it burns and imparts a bitter taste to the finished product. After around 5 minutes, flip the steak and repeat the same process. Take the steak off the grill and use an internal temperature probe to measure the steaks doneness. For medium rare, take the steak off when it’s approx. 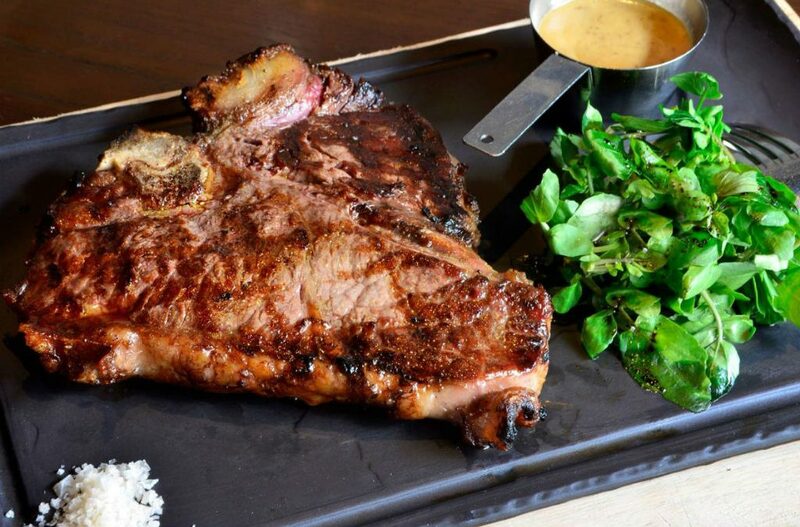 48°C next to the bone, because there is residual heat in the steak that will continue to cook it once it’s resting. Allow the steak to rest for 10 minutes *don’t rush this step! This step will allow the meat to relax and the juices to redistribute evenly, so when you are ready to cut it, all those delicious juices stay in your meat rather than on the plate. Once its rested, give the steak a 30-40 second sear on the grill again to make the outside crunchy and sizzling hot. Brush it with the brown butter and season it again with a little bit of sea salt and pepper. Serve with a piping hot jug of mushroom sauce, and any other favourite steak condiments. We like to serve our steaks at the restaurant with a small salad of watercress dressed with balsamic vinegar for balance and a liberal pinch of Murray River Pink Salt.